We are considering switching our Avon 3.4 RIB for a 12' wide body aluminum dinghy and wondered if people had any experience with carrying an aluminum dinghy on weaver Davits. We have a Sea Wise lift system for lifting our current setup but are considering the aluminum for several reasons such as, fishing, hauling crab/shrimp gear, going ashore with rough shoreline conditions,and carrying stuff. Does anyone carry something like this already? What do you think? Wondering if it would work or not. In the mid 80s we cruised the mid east coast with a Pilgrim 40 doing 6 month legs. We carried a 12 ft Al. skiff on the top deck. The pros good speed with 10hp motor-impervious to grounding and docking bumps and generally indestructible relative to FG and inflatables-row-able to some extent better than inflatable. Did tow ok. Cons gets hot in sun-not pretty-can sink if there is not foam flotation. Can ding mother ship if not protected with some kind of bumper system. I think I should clarify my question a little. I am wondering about putting a 12' aluminum dingy on its side on my swim step like the current RIB we have. Sorry for any confusion. You'll probably need additional support pads for the mounts. Little extra aluminum should do the trick. Think I'd prefer aluminum too if I could carry a 12'. May not be pretty but sure is practical for fishing and crabbing. Great idea Keith. Lightness is golden here as is the amount of usable space in the boat. Easy to handle because it's light and performance a RIB can't even dream about. Much smaller engine required = even more performance. If you always or mostly tie to one side get a 14' skiff and let 2' hang out ... probably the bow. Should work at least most of the time. You could really do things w a 14' skiff w 20 - 30hp. Makes me wanna have a wide boat. And the lack of beauty can be solved, (largely) .. in a word .. "paint". Not sure if you have these in the US, but we water tested one of these and as a result are buying this as out tender. 3m Catamaran Spindrift Dinghy with 6hp outboard motor - DELIVERED AUS WIDE !!!! for sale in Melbourne VIC | 3m Catamaran Spindrift Dinghy with 6hp outboard motor - DELIVERED AUS WIDE !!!! I did consider a 14' but felt it might stick out further than I want. Yes, the space and a number of other things would be awesome, no question about it but I don't want the extra hangover on one or both sides. 12' is perfect for that right now. I guess I could always tow it and then mount it when doing major crossings and after we docked in a Marina......but on the hook, perfect. Right now I want to be sure mounting it like my RIB is something that could done without harm to the dinghy or my GB. The setup I have now is slick, just not particularly what I would have personally chosen myself. I am sure you get this one! Always some kind of tweaking to make our boats ours and suited for our needs. Thanks, but I think I am looking more for a small aluminum skiff for our needs. Interesting looking craft though. I would love to hear how it works out for you. I will say they look incredibly stable. Hard to argue that. Hendo, that Spindrift bears a striking resemblance to our Livingston in hull shape. I have an 8' model (now discontinued) that is extremely stable and easy to enter from the water. But at 235 lbs the 12' model Keith would be after doesn't sound like a lot of fun to beach. Have you considered an aluminum hull RIB? I've got one as a tender and love it so far. ALL pro, no con , indestructible is big positive as is the fact of limitless life in sunshine. In the Carib and other areas its less likely to be stolen. We tow a 11 ft Boston Whaler. 20 hp outboard. Wish some times it was a 22 ft center console and others wish it was a 8 ft inflatable. Otherwise happy with it. I can stand right on the edge of the bow and throw cast net with out tipping. Run it up on rough beach, goes 18 with out a problem and carries all our stuff for a day of fishing. It is a wet ride at high speed in chop. took a wake from a big fast boat at 16 kts and lost the cowling when we landed. We would swap it for the 13 ft model and then complain it is too big or small. Boats are compromises any way you look. My fiberglass 12 foot dingy turned up on Weaver davits has been a mixed issue. I love the Weaver for ease and stability for when boarding...the glass dingy didn't have enough gunnel to support itself so I had to engineer a few fixes. 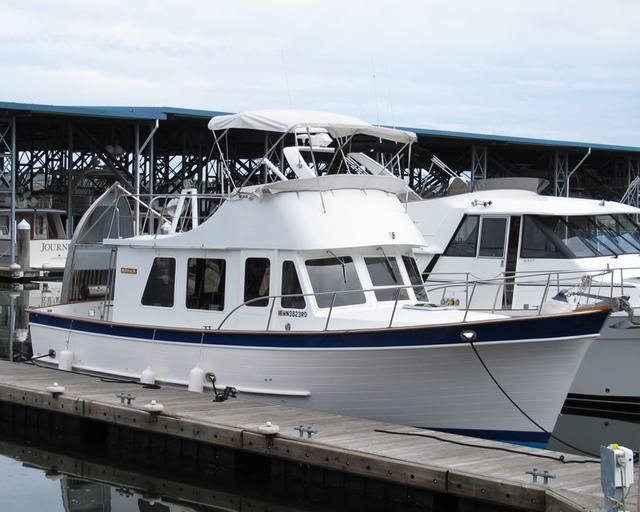 My trawler transom is right at about 12 feet and I usually tie port side to. The first part of my trip I had the transom of the dingy on that side and I caught a few cleats when departing docks under less than perfect conditions. The davits got pretty well bent but I could straighten them some and they still work fine. I would love to and just might trim 6-10 inches off the bow of the dingy (it already has a flat nose) so that catching things on the dock when I need to spring off or slide down the dock is necessary. Thanks for all the replies. I think we will begin moving forward with this idea and look closely at a couple of the aluminum dinghys we have been considering. Figuring out where to place the weaver hardware and how to reinforce the aluminum if needed. So far we are only looking at welded seam boats, had a riveted one awhile ago and over time it developed small leaks, nothing horrible but we do not want that to be an issue in the future. We looked at aluminum RIBs and had the same concerns as with our current rib, possibility of tearing fabric with gear and the loss of inboard space. I appreciated everyone's thoughts on this. Thanks. For the Weaver mounts you make quality plywood backing plates. Could make them for both sides of the aluminum hull like a clamp. As for boat brands 85% of the aluminum skiffs in SE AK are Lund like in my previous post picture. That one was actually a rental. I don't know if they still make it but Lund made an 11' lightweight version of their basic sportsman skiff. I tried to buy a used one in AK but the owner wouldn't sell. I have a Crestliner 16 that's much heavier than the Lund (400lbs I think) so when your shopping check the weight. The 11' is so light you could have an 8hp that you could take off, pack up the beach and go back to get the boat and gas ..... and beer. I personally don't consider a dinghy a dinghy unless one can pack it up the beach and go ashore for a few hours. I am thinking about aluminum plate and avoiding as much wood as possible. But we'll see how I sort all of this out. When I bought my boat it had an aluminum dinghy on swimstep davits. It was unusually mounted with the davits on the dinghy transom. The PO had a winch setup from the flybridge which allowed a line to be run down to the bow of the dinghy enabling easy hoisting to a vertical position. A short piece of PVC pipe was then used to serve as a standoff between the winch base and the bow of the dinghy. You can see the standoff and the winch setup in the picture. While somewhat unconventional, the setup worked well. I still have the aluminum dinghy, and have left the setup intact, but currently have a more conventional setup with a fiberglass sailing dinghy (which I like to row). Couldn't attach motor with transom davits, so side davits are also helpful, but not required. I would lower the dinghy, then switch to the side davits to attach the outboard.